Nice line here taken from @JasmineC in the APAC call this morning with regards the Dow creeping higher; " A word of warning must be disclaimed with the Dow Jones as relatively high as it: though one wouldn’t want to call a marked sell-off, rallies for the Dow Jones that extend this far above the more comprehensive S&P500 often result in a pull back for the Dow Jones, as traders buy into the index in an attempt to enter-and-exit the market on the basis of rosy-sentiment." The S&P gives a better overall picture than the Dow but I use the Dow simply because I found more forum uses followed it, the reason I figured was because IG had a heavy min bet size on the S&P though that seems to have changed at some point since I last checked. 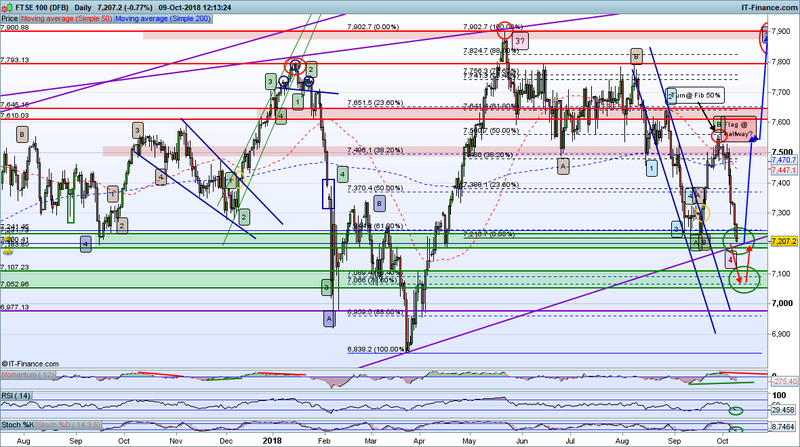 So the Dow may well pull off a bit and follow the Nikkei while Dax remains trapped in it's inner triangle within a triangle (base at 12189) and FTSE in a similar holding pattern bouncing between 7443 and 7557. 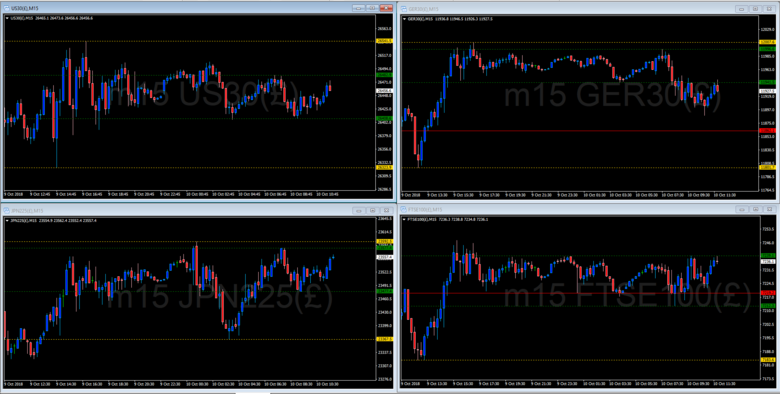 Reminder it's a German bank holiday today and so the Dax is putting in some odd out of hours small time frame bars. The switching between Dow and NASDAQ makes a lot of sense considering that markets are not just risk on/off but there is also a sliding scale within risk on and risk off. So the more risk on you felt the more you would weigh your portfolio toward NASDAQ for example. The Dow got a good lift off of the high ADP NFP yesterday which came in at 230k and bodes well for Friday's NFP and also the non-manu PMI which came in a whopping 61.6. After the new high in Dow came the pullback which seems to be continuing this morning as the Dax rips lower on the Euro open heading down towards support at 1220. The FTSE not getting involved with it's attention drawn to the con conf and the Brexit deal uncertainty. 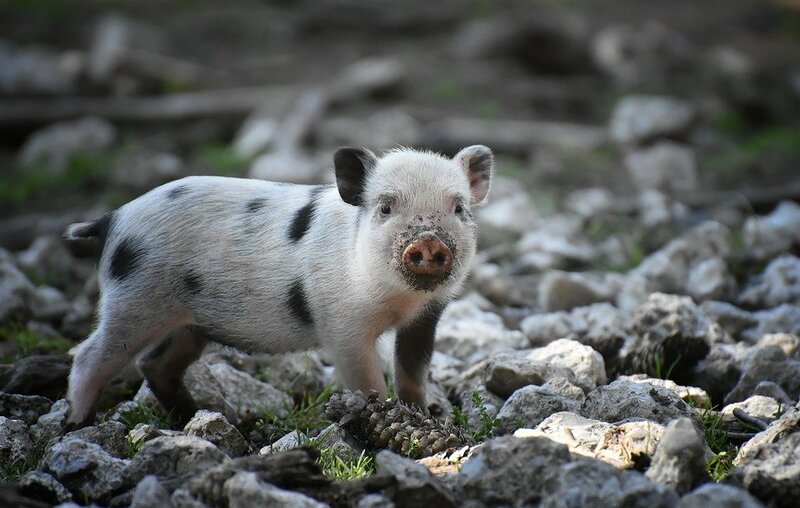 So in a reminder that sometimes technical analysis 'ain't worth a d amn' the Dow has been leading Dax, FTSE and Nikkei around like sheep for the last 1-2 days (as was mentioned in the FTSE 100 thread yesterday). In an interesting study in index uniformity the three followed Dow down starting at 19:00 Wednesday then after a short pause followed Dow down again starting 14:00 yesterday til 19:00 when it started to lead them all back up. Though this is not always going to be the case it shows it is always worth keeping an eye on the market leader. A very thin calendar this week and today is a bank holiday for the US, Cad and Jpy. Looking at the daily charts and the Dow retested support then made a strong recovery leaving behind the Dax and FTSE to languish at their own support levels. If Dow can continue higher today I would expect both Dax and FTSE to follow, FTSE has been tracking the Dax intraday for a couple of weeks now. 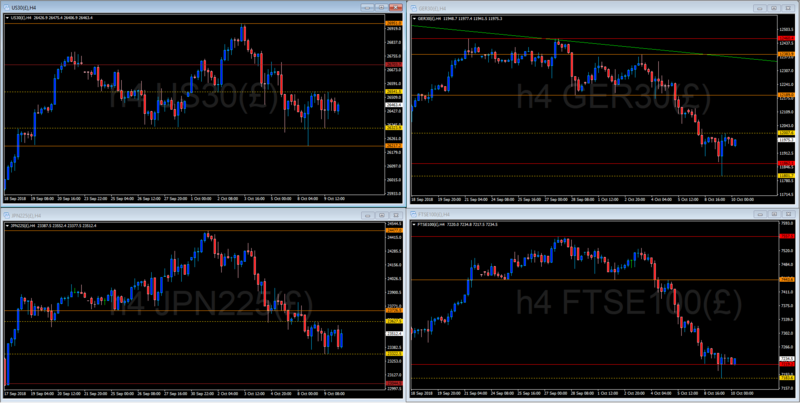 But if Dow decides to head down again Dax and FTSE could be in some trouble as the red support levels are weekly. 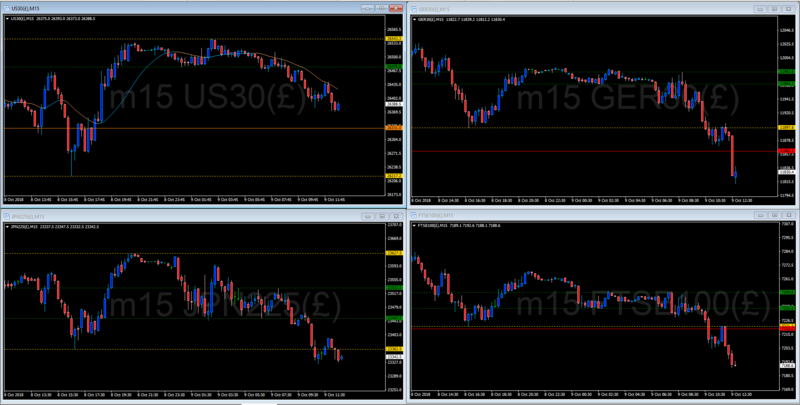 The monthly support level below for Dax is at 11690 while for FTSE it is at 6839. 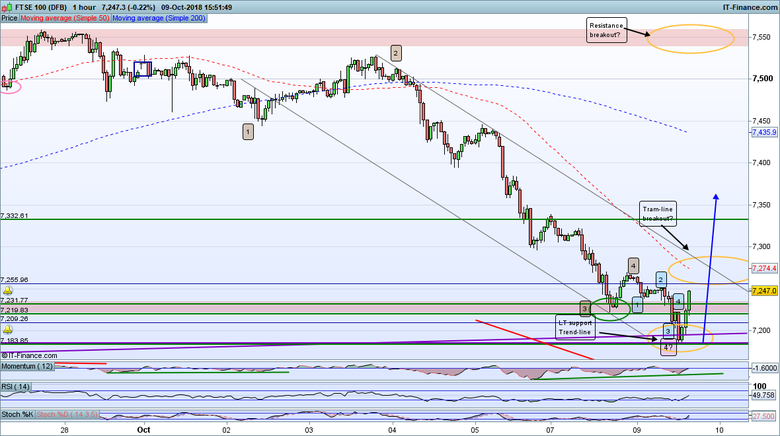 As for the FTSE, I think the 11 Sept low is the key here. Price stayed just above it yesterday and it it holds and rallies from here that will be a good sign for a strong rally. Even if it goes below it can still bounce of the lower supporting trend-line (I'll post more details on my FTSE thread in a tick). All-in-all it looks like the race to the top may be back on but watch out for that US volatility. 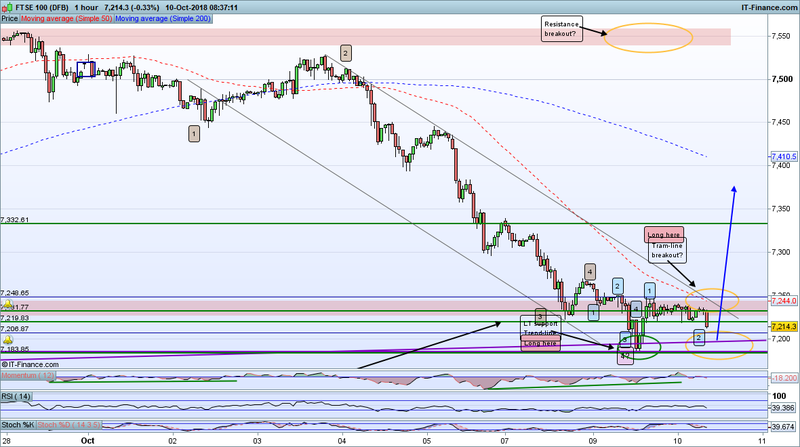 FTSE this morning might be the better trade. Definitely volatile at the mo @Mercury and no clear direction yet, price drifted down a little on the Euro open but there has been a right battle since the London open. The Dax wants to push higher but seems capped by Dow which looks happy where it is as attempts to push both higher and lower have stalled. So all three are boxed and waiting for a break. I always find it interesting @Caseynotesthat open markets are seemingly stalled by out of hours trading on bigger markets... To me this is a clear example that stocks are not being bought based on the prospects on individual companies but rather on financial engineering of share price and central bank manipulations. This will end very badly indeed in my view. Continuing globalization @Mercury, IG can't even come up with a spell checker that uses English english. 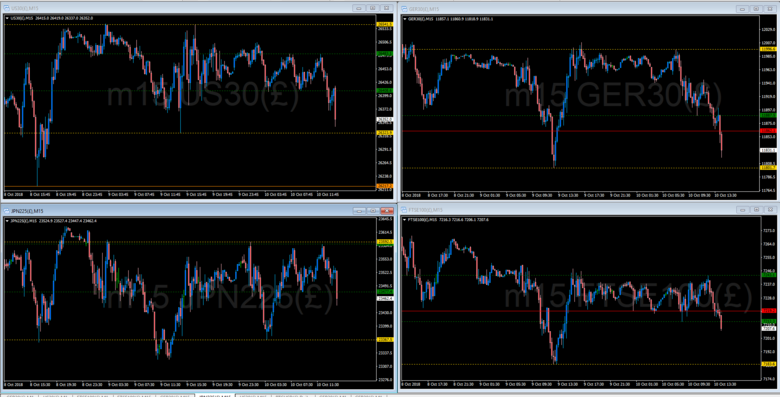 It wasn't that long ago when these markets closed and gapped everyday, now they are strongly tied 24/5. Occasionally on nation specific news one will march off in a different direction but once a new level is established will soon fall back into step. Dow has just pushed lower, Dax and Nikkei have followed and FTSE is frozen staring at that rather intimidating support level immediately below it. 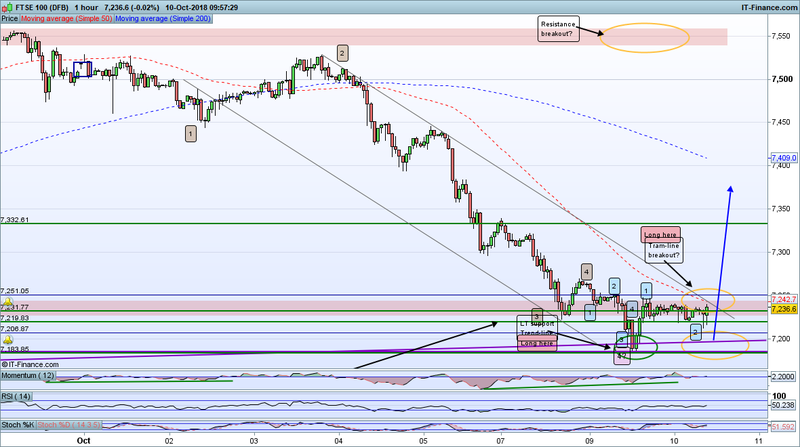 Yeah, was unlikely to be a hard retrace so now I am looking to the LT supporting Trend-line. Looks like we are coming up on a potential USD turning point too, will they swing in a coterminous fashion of blast through into a full on Bear? This is a very important point in the market I feel! It does look a significant breach of a support level that has held for over a month, will be looking to see if the daily bar can be salvaged, price is coming back up for a retest now. Maybe, although I see the support levels a bit further down on the Daily chart if you look back a bit further in time. There is support around about the LT trend-line but a temporary spike through break and recovery (weekly chart view) to the next support level around the Fib 76/78% is also a candidate, especially on US indices volatility. There are a lot of set up scenarios here, including "boom!" but because I haven't see NMD at the top I don't see the big drop yet. Also there is PMD building and lots of support so I am minded to stay on the side of looking for the bounce into a rally phase rather than take shorts at this juncture. 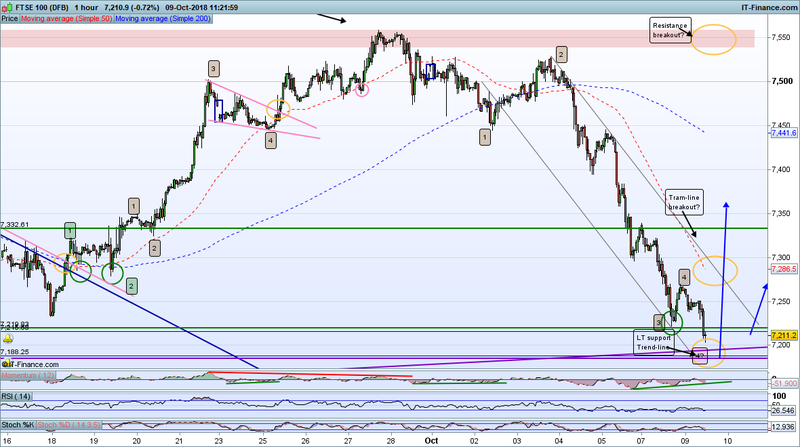 A strong and confirmed break through LT support would change that but no there yet. So Dow, Dax and Nikkei heading back into this mornings range, the FTSE following somewhat reluctantly having worked so hard to break the support level. Not sure what the Americans are going to make of this little joy ride when they fire up their screens. 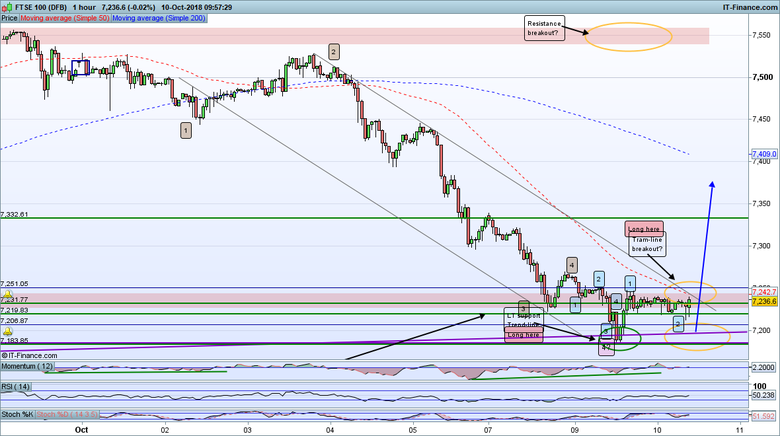 FTSE100 touched 7184 twice before rallying, one point below my turn area and right on the LT supporting trend-line. 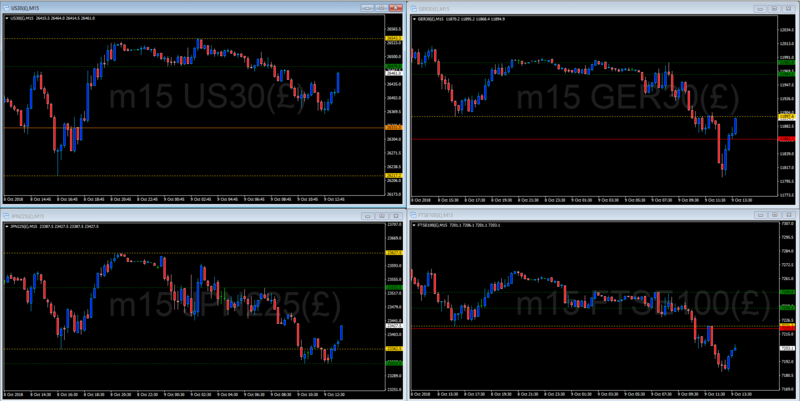 In the US session yesterday Dow retested support at 26323 then returned to test resistance at 26541 with the other 3 tracking as best they could, bit of a rollercoaster that left FTSE sitting on it's weekly support level. Nikkei is putting in a strong 4 hour bull bar this morning and may be a clue for the Euro and London open with Dax in a good position to strike at the 12000 resistance level. I was hoping the Nikkei would be stronger over night and show us a breakout but didn't happen. On the plus side it didn't capitulate either so back to Europe and the US. I expected, and we are getting, a small retrace to set up a rally (assuming the market doesn't break down of course). On the FTSE100 I am seeing the retrace on opening, which may test the LT trend-line again around about 7200 I am guessing. The best trade set up for me is a strong break of the upper tram-line and resistance zone after a bounce of the LT trend-line. We are also seeing associated retrace action on FX pairs. On the FTSE100 there has been a bounce this hour, not yet pushed through the resistance and upper tram-line but somewhat encouraging for those seeking a rally. 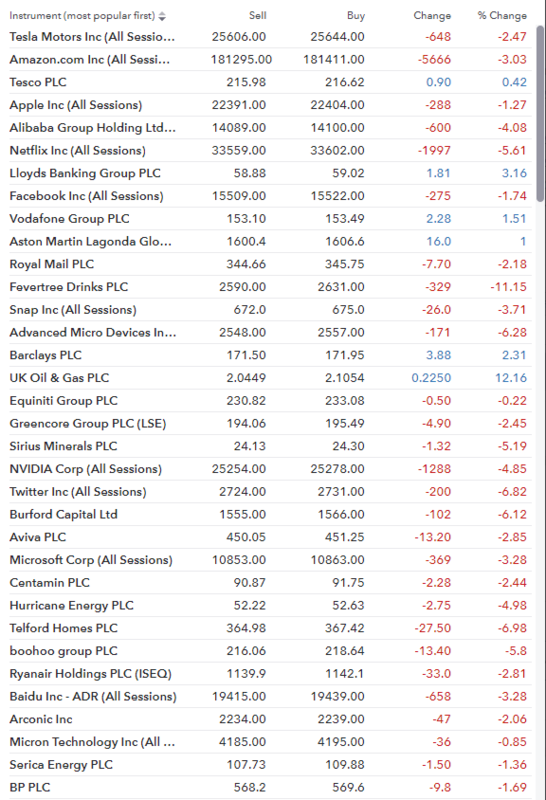 Next few hours will be interesting, will the FTSE take off on its on volition or wait for US stimulation. 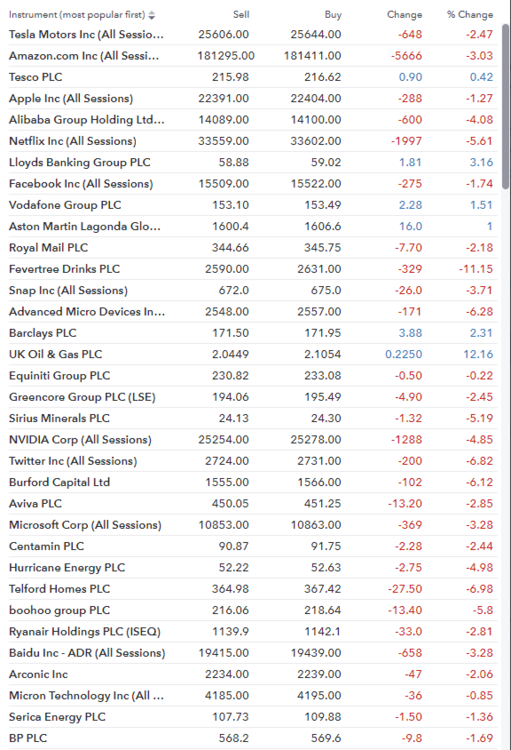 Note of caution there is a fairly chunky divi today on FTSE I think, so watch out for that. Big push down on the US open Dow in a replay of yesterday looking to test 26217 again, interestingly Dax got the drop on it moving through it's own support on the bar before. tech stock getting hammered today and leading the pull back. Look at those moves!!!! !